And the brave feline gracefully wanders into the setting sun to inspect the borders of her territory. Who knows what dangers may be waiting in the shadows? She hears a stifled meow. Is it another feline already endeavouring to steal the right of way and add the Tabby land to its own territory? Will this eternal fight for territorial rights never end. There are traces of blood on the ground accompanied by a long track leading to a tree. She paws carefully, not wanting to be a victim of an intruder. Behind the tree she sees Butch, the gatto di tutti gatti, with the extra claw on each paw. Tabby decides to investigate and Butch is busy devouring a mouse, but this is Tabby territory. What should Tabby do to defend her feline rights. 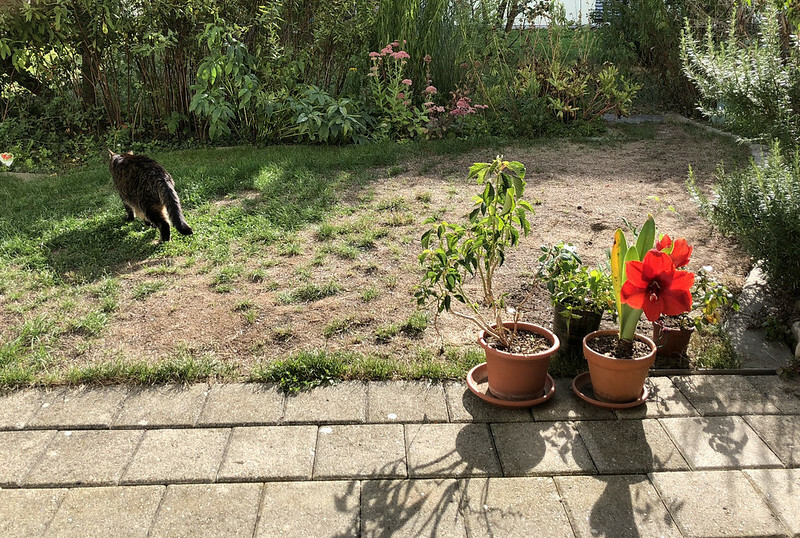 There is only one solution, she retraces her pawsteps, carefully covering the path left by Butch the invader with earth to ensure that no Tabby scent can be traced. She makes a wise decision and re-enters her home through the cat flap. Another one of her lives rescued, but tomorrow she will return. Perhaps Butch did not eat all the mouse and there will be something left for her. Oh Tabby, good call. And tomorrow any remaining bits will be nice and ripe! Smart and graceful, Tabby. Wise decision.